Strategy: A small tube is inserted into the affected disc. Protruding or prolapsed discs can put pressure onto the spinal mellus or nerve roots in the spine. This can cause deep-rooted back pain. After exhausting all conservative treatment methods (physical therapy and pain therapy), the Disc-FX technique is a minimally invasive nucleoplasty for treating this discogenic pain, i.e. pain caused by the disc. Disc-FX technique: Combined procedure of endoscopic disc surgery of mechanical treatment with micro-forceps and electrothermic treatment with localised generation of heat. Protruding disc:Bulging of the disc, can cause pressure on the nerve roots or the medulla. Discogenic back pain:Back pain caused by disc material putting pressure on nerve roots or medulla. Endoscopic disc surgery: Disc surgery without incision and sutures through a surgical cannula (hollow needle) with endoscopic view of the surgical site. Percutaneous nucleotomy: Minimally invasive (endoscopic) treatment to mechanically remove material from a bulging disc. Which surgical procedure can help with a bulging disc? Treating the bulging disc with the Disc-FX system. Bulging discs are caused by the liquid nucleus pulposus shifting inside the disc. The fibrous ring of the disc is deformed, but not yet ruptured. The Disc-FX technique is a percutaneous endoscopic nucleoplasty. That means the surgery is performed without surgical incision. Merely a surgical cannula in inserted through the skin into the surgical site on the disc. The procedure is performed with a direct endoscopic view using a small camera inside the surgical cannula. The position of the needle is monitored by x-ray. Following the procedure the surgical site can be closed with a plaster (no sutures). The endoscopic Disc-FX procedure keeps scarring near the spine to a minimum. When can the Disc-FX procedure no longer be used? Surgical site or disc protrusion located beyond reach of the endoscopic access. Disc-FX presents a new development in the area of minimally invasive spine surgeries. With a working access size of only 2 mm, Disc-FX provides the option to remove disc tissue within and outside the spinal canal (extra- and intraspinal), and to achieve therapeutic stabilisation of the annulus. A thermal procedure to reduce the volume by evaporating disc tissue (ablation). 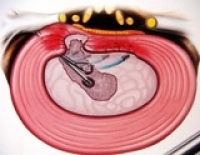 Removal of protruding or prolapsed disc tissues using surgical micro-forceps (nucleotomy). Small parts of the gelatinous disc core (nucleus pulposus) are evaporated using high-frequency current. The protruding disc shrinks, restoring its normal shape. The protruding fibrous ring of the diseased disc can withdraw due to the reduction in volume, thus pressure. Pressure the disc puts on the nerve root decreases. Back pain and pain radiating into the leg (sciatic pain) decreases after the procedure and disappears. When will the Disc-FX provide limited relief for disc protrusion? In some patients, reducing the disc volume is not sufficient for performing this procedure for discogenic back pain: Similar to an overstretched elastic band, the firm fibrous ring surrounding the disc is no longer able to return to its original position after the pressure is reduced. In the worst case, residual pain with radiating pack pain and leg pain can remain. Here an extended Disc-FX treatment concept takes effect: Tightening the disc case through thermal coagulation. In addition to shrinking the gelatinous core of the disc, the flexible probe of the Disc-FX system, however, also allows for targeted treatment of the fibrous ring. The thermal procedure of the Disc-FX technique thickens the disc’s fibrous ring (annulus) at the diseased protrusion (thermal coagulation). This reduces the protrusion. Reducing the protrusion relieves the nerve root (decompression). Discogenic back pain and pain radiating into the legs is reduced. The thermal procedure can also reduce pain fibres which have migrated into the disc walls, achieving analgesia for discogenic back pain. Patients are typically placed in the lateral position. The procedure is mostly performed under local anaesthetic monitored by an anaesthesiologist. After identifying the affected disc segment on x-rays or CT, the guide probe (endoscopic access) is introduced into the diseased disc compartment with a needle under local anaesthesia. The cannula is then inserted as the endoscopic working access to the diseased disc. After reviewing the position of the endoscopic working cannula, primarily the inner of the disc is then shrunk, followed by shrinking (thermal coagulation) of the annulus. Due to the generation of heat being localised by the thermal procedure, the pain fibres of the disc annulus are also removed as a desirable side effect. Even pain caused by the diseased disc is therefore neutralised (discogenic pain). This endoscopic disc surgery can generally flexibly expand the endoscopic disc surgery by another treatment step without additional surgical access: Instruments can be inserted using the same access, if necessary. The nerve root can be assessed with a direct view through the endoscope. A study by the University Hospital Munich showed back pain to improve within 2 days following the Disc-FX procedure. 82% of all patients treated with Disc-FX also showed medical improvements of the discogenic back pain after 2 years. The success rate of Disc-FX is excellent with over 80% of patients satisfied with the procedure. However, this procedure too can only yield success after strict and sophisticated diagnostic evaluation. Discogenic back pain typically resides within the first 2 weeks following the Disc-FX procedure. Follow-up treatment in form of intensive rehabilitation is absolutely necessary to maintain the result achieved, and to eliminate muscular dysfunction and weakness of the back. In addition it’s important to learn a lifestyle which is gentle on the back. There essentially is no surgery without risks: However, surgery-specific risks, e.g. damage to the nerve, can be minimised since the patient is only given twilight anaesthesia. This allows the surgeon and patient to communicate at critical times of the procedure.